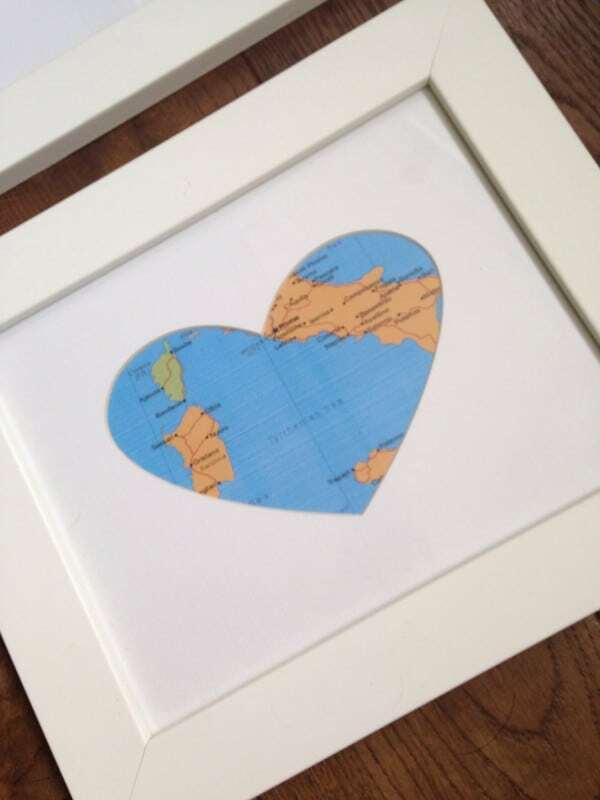 I saw these heart map pictures in a home design store and loved them but I wanted to personalise them to display places we had visited as a family. They looked quite easy to make, so I decided I would have a go at them myself. I had planned to make the heart mounts but found them in Wilkinson’s along with the white wooden frames, which were exactly what I was looking for. I printed maps off the Internet; I chose the Caribbean and Italy with Sardinia and Sicily as these places hold happy family memories of holidays and our adventures together. I am so pleased with the result and the fact that every time I look at them I think of family holidays. And they look great in my hall way. And do you know what? When we arrive home from holidays, the first thing I see when we open the front door is these lovely pictures. It really makes me smile and realise how lucky we are. These are such a great idea, Sarah. Ah thank you Jess, I know I love looking at them, I love maps sounds geeky doesn’t it ?